I’m curious about your ceramics with eyes. How did the notion of an object that looks back at the viewer come about? Well, it might have been because I was doing portraits at the same time that I started doing ceramics, but I also wanted really early paintings that I did when I was 18 or 19 to have eyes. I’ve always liked the idea of objects looking at you. For the first several years I made ceramics, they almost all had faces and eyes, sometimes quite disguised. 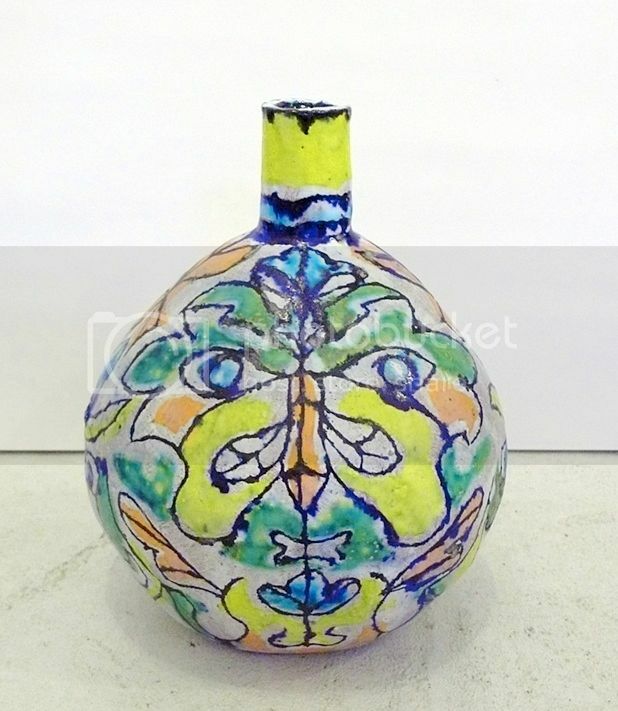 The pattern on this piece from 2009 (gestures to colored ceramic on the floor) was taken from an antique French tapestry that Louise Bourgeois used for a sculpture of a head. It’s a leaf face with eyes and a mouth. I was after a specific expression, rather sad and blank. In the last few years, the faces began to feel cartoonish, so I switched to large aggressive flowers. What was the portrait work you were doing at the time you started making ceramics? It started when my father died. I was devastated and I wanted to do something with the feeling. I made ornamental drawings of angels and also some drawings of corpses done from pictures I found in the library – the first time I ever worked from photographs. Later, a friend asked me to be in a show about David Bowie. I liked his gallery and I wanted to be in the show, so I found a bunch of pictures of David Bowie and made drawings looking at them. This was the beginning of my portraits. My father wasn’t particularly flamboyant, but he did have a moustache, and sometimes he sat in a chair in a certain pretentious way that reminded me of Dali. So I began doing drawings of Dali, again from photographs. I then went on to other aging, flamboyant characters including artists Nevelson, Warhol and Fini, fashion designers Erte, Chanel, Trigere, and art world characters like Peggy Guggenheim. I was interested in mortality and decoration, aging people defying death through extreme dressing up. Later I carried the idea of transformation even further with characters in drag: portraits of Ethel Eichelberger, Candy Darling and Jack Smith. At the same time I was doing large drawings of colorful airy pavilions, using expensive Japanese paper. I would begin at the bottom with a horizon and continue up adding sections in pen and liquid watercolor. If I made a mistake, I realized I could cut out the part I didn’t like and neatly collage in a replacement. I began doing the same thing with the portraits, and eventually I began getting messier, constructing the faces by gluing on separate features, which reminded me of putting on makeup. Around the same time I became friends with an artist and drag performer whose work I had loved for years. I photographed his performances and used them to make drawings. The drawings weren’t pretty, but he tolerated me. He was my first (and so far only) live muse. It’s interesting because you’re a female artist whose gaze is setting upon men who are bending gender. I admire the guts it takes for people to transform themselves so dramatically. I am fascinated by metamorphosis. When did you begin making ceramics? This was also quite happenstance. My husband wanted to get a kiln and make ceramic sculptures, so we decided to take a class at a small local pottery studio. I had recently abandoned painting for drawing. I was tired of painting’s historical baggage and wanted to do something lighter. I’d always liked the decoration of historical ceramics, so I thought, why make paintings about it when it’s so much nicer to make the ceramics themselves. What about decoration appeals to you? I like an extreme environment that’s visually over-the-top. I remember when I went to Mexico in 1990 I was interested in the colonial hybrid decoration that is Spanish and Native American together. I thought, oh my god, everything is so decorated and everything is so colorful. I just love that. 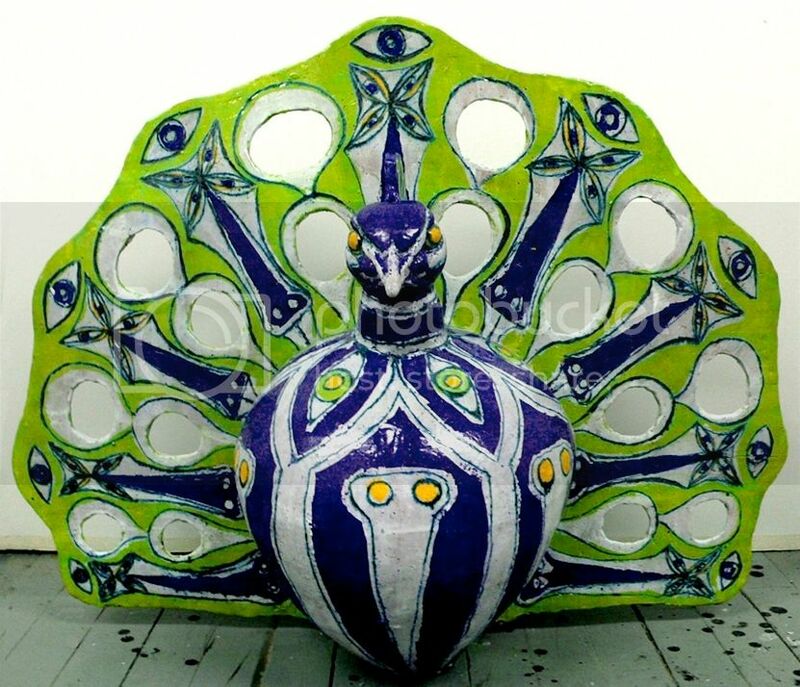 Eye Peacock, 2007, glazed earthenware, 25"x27"x12"
How do you make your color choices for the ceramics? I’ve become comfortable with a group of underglazes I mix myself. I’ve chosen the colors that are clearest: lime green, turquoise, yellow, yellow orange, orange red and deep blue. I want the work to emit light – I adore Matisse – but at the same time I want it to be loud and defiant. Bright colors don’t always signify happiness; they can express other emotions, perhaps exhibitionism and rage. They may also cover up things you want to hide. Where do the patterns and motifs that decorate your ceramics come from? I look at a lot of things: Islamic, Central Asian and Russian textiles, Ballet Russe sets and costumes, Islamic and Spanish ceramics, Wiener Werkstatte design. I improvise from images I see in books or in photos I take at museums. I’ve always been interested in foreign cultures. I had a collection of costume dolls when I was small. You mentioned “decoration and mortality”. How did those two come to pair in your mind? I think it was through the idea that the extreme behavior and the extreme of visual expression, the personal visual expression of someone like Dali, or also Warhol, those different artists as they aged – maybe they were always flamboyant – but it seemed to me as they aged, that the flamboyance was like a battle against death. Did your father influence you as an artist? Yes, I think so. He was an architect. My parents encouraged me to make art and sent me to an after school sculpture class at the Museum of Modern Art. My father always painted. Some of his work was quite interesting, especially a few quite surreal pieces made when he was in psychoanalysis, before he had his crazy shrink committed. After that he painted athletes, trees, and portraits of my mother. So you’ve been making art your whole life? Always. At 5 or 6 I was planning to be a mommy, but a few years later I knew I was going to be an artist. I took sketch classes on Saturdays at the Art Students League as a teenager. When I finished high school I’d had enough of academics so I continued there instead of going to college, not exactly the best career path. I didn’t have a clue about contemporary art, but I tried everything else. I was aware of the old masters, Post-Impressionism, Matisse and Picasso, and Abstract Expressionism. I began rather abstractly doing hallucinatory paintings with hidden figures out of my imagination, but then for some reason I became compelled to make my way through art history and conquer the representation of three dimensions. Life drawing, modeling clay sculpture figures, wood carving, still lives, and so on – all things I’d now advise artists to skip unless they are necessary to what they want to do. Next I learned etching at Hunter College and then I enrolled in the studio semester program at Empire State College. It was designed to allow art students from upstate to experience the New York art world by providing studios in Manhattan at State University tuition, which was really cheap at the time. Contemporary artists like Eric Fischl and Carolee Schneeman came in and talked about their work and looked at yours. That’s when I became aware of what was going on around me. What was your impression of contemporary art when you started to encounter it? I wasn’t really crazy about macho Neo-Expressionism and the messy East Village scene. In the nineties the market crashed and things became more modest, which I liked. Of course now I’m more open-minded and interested in a lot of art I once dismissed. What do you think about where art is now? There’s a lot going on. I tend to like dark, sensational, somewhat twisted things, maybe because they make good copy. I was writing for Walter Robinson during the last four or five years of Artnet and I knew what he liked – TABLOID. I had a great time writing about artists like Otto Muehl, the Viennese Actionist who recently died, as well as Genesis Breyer P. Orridge, Miriam Cahn, and Ron Athey. But I also love Tabboo!, whose work is supremely joyful. 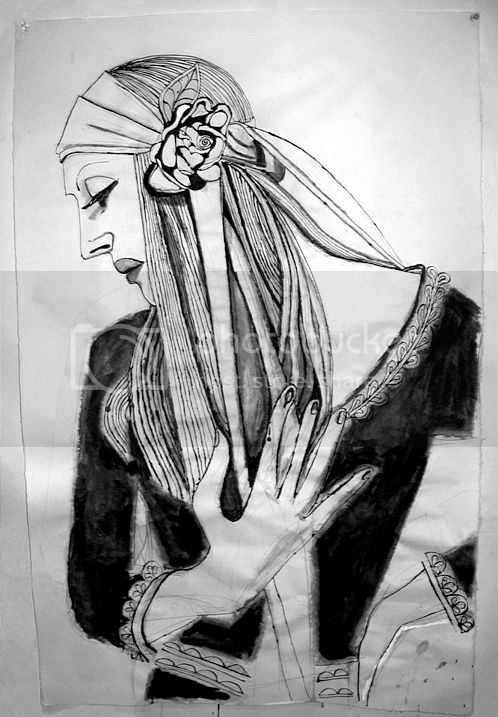 Candy Darling, 2006, pencil, ink & gouache on Japanese paper, 38 x 26"
What’s a recent show you’ve seen that was good? The Kolomon Moser show at the Neue Galerie is sublime, and my friend Joyce Pensato’s retrospective at the Santa Monica Museum is fantastic. Given that you have been a lifelong artist, what advice would you have for a young artist starting out today? Learn a skill that is in demand and pays extremely well by the hour. I never did that. I’m working on drawings for two large round bottles to go with the four that are already done. I’m also making five longer, skinnier bottles that I can put in between the six large three-part bottles I finished last year (gestures to line of large ceramics). It was fun to make these exuberant and crazy shapes, but then once I was trying to figure out how to decorate them, I felt somewhat constrained. Complicated shapes need simpler decoration. The round ones can be more complex and interesting. I have also decided that it would be nice to unify everything I have [at the studio] with some really aggressive black and white wallpaper. I’m running out of space and there’s only so many more ceramics I can make. Eventually I may go back to doing portrait drawings, and hang them on the wallpaper, which might turn the other work into décor for the spaces where they live. I went out and got a little silkscreen kit and I’m starting to figure that out. Is that typical of your process? The idea is followed by gathering materials and then playing around? I would say that my process is really quite obsessive. For example, I did a printmaking project for Randy Wray’s Element Editions in 2010. He wanted a group of unique variations on one print, but I wound up making 4 small and 4 medium plates to warm up and then 6 larger ones, each with two versions in black and white, and more in colored ink with collaged and painted additions on white paper, and even more in colored ink on colored paper. I worked on them for months. Similarly, every portrait subject is drawn repeatedly and each ceramic bottle that I make requires extensive preparation with many black and white drawings and colored watercolors before I can finally apply decoration. Although I strive to make things look as if effortlessly done in one breath, I don’t work quickly. Everything must be completely explored. All images courtesty of Elisabeth Kley.